This page documents the dialogue for guards in Skyrim. "Yes, Dovahkiin? How can I help you?" Complete the Main Quest. "Whatever you need, Dragonborn. Just say the word." Complete Dragon Rising and use your shout. "You should talk to the Jarl up in Dragonsreach, lend any aid you can." Guards in Whiterun have this dialogue before Bleak Falls Barrow is completed. "Stormcloaks, Imperials, dragons. Ain't no matter to me what I kill. Let them come." Whiterun guards before and after Battle for Whiterun (Sided with the Legion). "Guard might get nervous, a man/woman approaches with his/her weapon drawn..." Approached by the player with weapons drawn. "Sheathe those claws, Khajiit." Approached by the player with fists raised. "You come up to me, fists raised? You looking for a beating?" Approached by the player with fists raised. "Whoa, whoa, whoa! Watch the magic!" Player casts a spell in the guard's presence. "Go cast your fancy magic someplace else." Approached by the player with magic spells ready. "By all I hold sacred... that's a Shout! Like the Graybeards [sic] on their mountain!" Player uses a non-aggressive dragon shout in front of a guard. "By the Gods! What manner of power is that?" "It is the power of old! The Voice of the Dragonborn!" "The Thu'um! He/She summons the Thu'um!" "I need to ask you to stop. That... shouting... is making people nervous." May happen when the player uses any dragon shout in front of a guard. "Well. I'll let it slide this time. But you'd be smart to take that off. Someone might get the wrong idea." Apologizes to Captain Aldis for wearing Stormcloak Armor. "Hmm. I still don't like it, but I guess I'll overlook it. This time." Convinces guard to ignore crime. These dialogue lines are based entirely on the race of the player with some variation based on guard faction and race. There appear to be no unique dialogue lines for Bretons. Guards will react to various player equipment including most armor, some weapons and Daedric artifacts. Not all have dialogue though, notable exceptions include Elven Armor, Fur Armor, Glass Armor, and all masks. * You must also have appropriate gear equipped. * Referred to as 'sir' even if female. "The Emperor's cousin Vittoria Vici's getting married soon. The reception is public, anyone in Solitude can attend." Solitude Bound Until Death not completed. "Be glad you're here in the city, and not out in Riverwood. Those poor sods don't even have a wall." Whiterun Civil War not yet begun. "I worry about the other settlements in the hold. Unwalled, lightly manned - prime targets for those damned dragons." Whiterun Dragon Rising completed. "Rorikstead's a nice little hamlet, but a boring post for a guard. If a dragon attacks, well... then it'll be a different story." Whiterun Dragon Rising completed. "The guards in Dragonsreach say you've aided the Jarl. On behalf of Whiterun, I thank you." Whiterun Bleak Falls Barrow completed, and stage 90 of Dragon Rising not completed. "My heart goes out to Clan Shatter-Shield. Kin murdered, family warhammer stolen... There's no fairness in all that." Windhelm Blood on the Ice not yet completed. Only Whiterun Guards have this dialogue. Only Windhelm Guards have this dialogue. "If I'd been on guard at the Thalmor Embassy, wouldn't nobody be disturbing that party." Complete Diplomatic Immunity. "Word is Elenwen's furious. Big party at the Thalmor Embassy, and one of the guests went someplace they shouldn't. Caused quite a commotion." Complete Diplomatic Immunity. Only Solitude Guards have this dialogue. "There was a fight down in The Ratway, but reports are... sketchy. Some say it was Thalmor Agents, others say Thieves Guild. Some say it was both." Complete A Cornered Rat. Only Riften Guards have this dialogue. Only Imperials will say this dialogue. Only Stormcloaks will say this dialogue. "You're the one that saved the Fire Festival. I remember." Complete Tending the Flames. Only Dawnstar Guards have this dialogue. "I heard to Gourmet is hiding out somewhere in Skyrim. You know, fella who wrote that cookbook." Started Recipe for Disaster or Complete Destroy the Dark Brotherhood! "The guards have been saying things about you... That you're the one that... Well... They say the Dark Brotherhood... Well. Never mind. Sir/Ma'am." Complete Hail Sithis! "The Emperor of Skyrim. Dead. These are dark times my friend - dark times indeed..." Complete Hail Sithis! "You hear the news? The Emperor has been murdered! Right here, in Skyrim. By the gods, if the Dark Brotherhood can do that, nobody's safe..." Complete Hail Sithis! "By the gods. The Emperor's been murdered. On his own ship... moored in the inlet. It was... the Dark Brotherhood. There was nothing we could do..." Complete Hail Sithis! "There are stories about you, and dark tidings in Dawnstar..." Complete Hail Sithis! "You're the one all the guards are talking about. You went into that Sanctuary... wiped out the Dark Brotherhood! Friend, I owe you a drink." Complete Destroy the Dark Brotherhood! "You know, I could have gone into that Sanctuary, killed all those Dark Brotherhood types. But I was... sick that day." Complete Destroy the Dark Brotherhood! "You! You're the one who wiped out the Dark Brotherhood! All the guards are talking about it... You're a hero to us all!" Complete Destroy the Dark Brotherhood! Only Markarth Guards have this dialogue. Only Falkreath Guards have this dialogue. Only Morthal Guards have this dialogue. "The Gildergreen blooms again. All thanks to you." Whether you get the first or second line depends upon how you complete the quest. "That sapling you recovered means the Gildergreen will live again. Your deed honors the people of Whiterun." Complete The Blessings of Nature by returning a sapling. Completed by helping Madanach escape. "Where're these vampires coming from? We need to wipe them out before things get worse." "Dragons breathing fire in the sky. Vampires brazenly attacking people on the street. It's the end of the world I tell you." "They say if a vampire so much as scratches you, you'll turn into one. That better not be true." "We need to do something about these vampire attacks." "By order of the Jarl, stop right there!" "You have committed crimes against Skyrim and her people. What say you in your defense?" "I can make all your problems with the guards go away. But it'll cost you. What do you say?" "Done. Now move along, before you get me in trouble." "Suit yourself, but you better decide what you want to do about this arrest. No one walks away for free." How about I pay you some gold and you look the other way? "Everything here appears to be in order. You can move along now." "All right, all right. Just keep your voice down and don't let me catch you again." "Since you put it that way, I think we can overlook your crime for now." "Oh, forgive me, Thane. I didn't realize it was you. We'll look the other way this time, but even the Jarl's influence has its limits. Be more careful." "All right, but you just watch yourself. Next time, I might not be so lenient." You caught me. I'll pay off my bounty. "Good enough. I'll just confiscate any stolen goods you're carrying, then you're free to go." "Smart man/woman. Now come along with us. We'll take any stolen goods, and you'll be free to go. After you pay the fine, of course." I submit. Take me to jail. I'd rather die than go to prison! "Time to cleanse the Empire of its filth." "Then suffer the Emperor's wrath." "Skyrim has no use for your kind." "Then let me speed your passage to Sovngarde!" "Then pay with your blood." "There's no mistake. You're a wanted man/woman... and it's time to pay for your crimes." "The only mistake was you showing your face. You've committed crimes against Skyrim and her people, and it's time to face the Jarl's justice." I don't have time for this. Do you? "You know what? You're not worth the hassle. Go... be some other guard's problem." "Well, your bounty is low... All right, get out of my sight. But you're known to me now, scum. Remember that." "Alright now. Everyone back away. Let the law handle this." "If anyone saw anything, step forward. Otherwise, step away from the body." "You there! Wait a moment." "You there. What do you know about this?" "I see... and this "force of habit", does it also compel you to murder?" Don't know what else to say... I had nothing to do with this. "Hmmm... You can go, but stay on your best behavior now." I'm not answering any questions. "Is that so? Well, perhaps a night in jail might loosen your tongue. Hmmm?" "Alright, you are now under arrest." "You shouldn't leave weapons laying [sic] around. Someone could get hurt. And if I see you do it again, that someone will be you. Have I made myself clear?" "See that it doesn't happen again." You have.... But I don't care. "No? Do you care about rotting away for a month in a cell? Ah, but nobody wants that, right? Painful for you, annoying for me. So, you pay my fine... and you walk away." I'm not paying you a bribe. Due to various reasons, some of the dialogue above will not be spoken by the guards without use of the console. 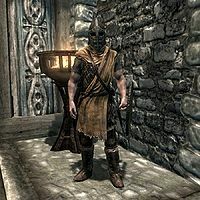 After repeatedly talking to a guard for a while, eventually they will get caught in a loop where they will only say, "What is it? ", "What? ", and similar phrases. This may affect not only the guard you're talking to, but also every guard within your cell. This is probably a bug with the way that phrases are randomly generated. Guards may refer to you as a werewolf even if you have been cured of lycanthropy. This page was last modified on 29 January 2019, at 04:59.